This is the ultimate springtime side dish. The asparagus and fava beans are blanched, so they stay really fresh and crisp. The lemon zest adds brightness to the dressing and the toasted almonds give a wonderful contrast of color and texture. Lovely! Fava beans are quite a bit of work- but worth it for a special meal. (Thank goodness my mom helped me shell them all!!) We enjoyed this for our Easter dinner this year with Salmon with French Lentils and Mustard-Herb Butter. Fresh peas could be substituted for the fava beans in a pinch. This recipe was adapted from Martha Stewart Living; I doubled the asparagus. The leftovers were delicious cold as well. I am bringing this side to share at Angie’s Fiesta Friday #66 this week- Enjoy! Heat oven to 400 degrees. (I used a toaster oven.) Toast the almonds for 2-4 minutes, or until fragrant. Set aside. Blanch fava beans in a pot of salted boiling water just until tender, about 1 minute. Transfer to an ice-water bath. Blanch asparagus in pot until just tender, 2 to 3 minutes; transfer to ice-water bath. Drain vegetables. Remove outer skin from fava beans (you should have 1 cup). Pat asparagus dry. Heat a large skillet over medium-high. Swirl in oil, then add garlic and fava beans and season with salt. Cook, stirring frequently, until garlic is softened, 2 minutes. Remove from heat. Transfer beans to a plate with a slotted spoon. Let skillet cool slightly, then whisk lemon juice into oil in skillet; season with salt and pepper. (Add more oil if dressing is too tart.) Add asparagus; toss to coat with dressing. Combine almonds and lemon zest in a small bowl. 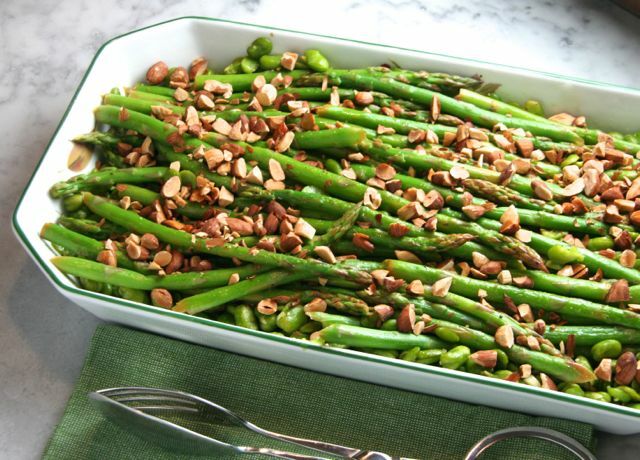 Transfer asparagus to a platter, top with fava beans, and drizzle remaining dressing in skillet over top. Sprinkle with almond-zest mixture and serve. This is gorgeous, Josette! Love all the textures. What a lovely vibrant dish of spring goodness. You put it together so beautifully. Yay for Spring!! 🙂 Thank you! I eagerly wait for your posts Josette. You bring in the simplest yet most gorgeous ones on the table. No complications at all! I like simple recipes…the ones that can be tried and enjoyed.. I am just crazy for asparagus but I’ve never had a fava bean! This recipe looks delicious and sure would be a complete meal or a nice side dish. Fava beans are special because they require so much effort to prepare!! Tender fabulousness inside a couple of shells… Super tasty! I am an asparagus newby. It’s taken me years to grow to like it, but slowly I’m converting and this dish may just change my mind completely! This is just so simply gorgeous! You have a beautiful touch with food! ❤ You are so sweet! This is so my kind of food! Yum!